Over a five-year period, a University of Kansas research team went undercover in the illegal pet and animal markets of Manila, Phillipines in order to catalog and conserve the impressive wildlife diversity of the islands. The black markets, in this case, were prime resources for the researches to gain information about the plight of many threatened and endangered species residing there. The team was lead by Rafe Brown, curator of the University of Kansas herpetology division, whose description of these places is very alarming: "The operations involve everything from sea turtles, to ivory, to tiger parts and rhino horns," Brown said. "These involve private individuals, pet store owners, politicians, zookeepers and corrupt government officials. Many animals are sold as pets and 'captive breeding' stock and zoo specimens. Many are sold as food, many are slaughtered and sold as parts for 'medicinal' purposes and aphrodisiacs, and many are huge, high-stakes status symbols for the wealthy elite - such as tigers, monkeys and Komodo dragons." During their investigations, the researchers sought to gain the trust of the hawkers so that they could compile a genetic database of the animals sold there in order to track individual populations (and secretly help Philippine police stop the poaching). The researchers bought three water monitors in order to genetically analyze them; to determine their origins and relationship to the wild populations surrounding Manila. The results shocked the researchers. The monitors they collected appeared completely unrelated to their wild neighbors. After further genetic testing at U of Kansas, Brown and his team uncovered that these animals represented a distinct species of water monitor that had been overlooked by conservationists in previous decades. They named these lizards Varanus dalubhasa and Varanus bangonorum. While they appear nearly identical to an existing species of Philippine water monitor - Varanus marmoratus - they had been trapped from an isolated island and are genetically unrelated. They were found to belong to the Varanus salvator species complex. The genetic differences can be explained by a concept called a cryptic species complex. A cryptic species is an animal whose morphology appears nearly identical to another species. Generally, they are easily mistaken as being the same animal but vary quite a bit on a genetic level and represent a different evolutionary lineage. This is not to be confused with genetic drift, a phenomenon which occurs when two populations of the same species become isolated and start to develop a different genetic traits. A cryptic species has already undergone this process and has branched from its ancestor population in the geologic past. "Both are gorgeous, black-and-white or black- and yellow-colored animals," Brown said. "They are dark in general appearance with bright speckling of white or yellow spots arranged in rows and stripes around the body, as if wearing shining necklaces. One gets up to a little over three feet in length, and the other is somewhat larger at about four feet. They're monitor lizards, so they're alert, with large eyes, continually flicking long tongues, which they 'smell' with, and they're generally very alert and look quite intelligent." That's great, but it's "just a lizard"
Hold on right there! Varanids are a fascinating and charismatic reptile family and further reading into them is greatly encouraged. Most monitors are carnivorous and all are at least partially venomous. (Fry, B.G. et al, 2006). 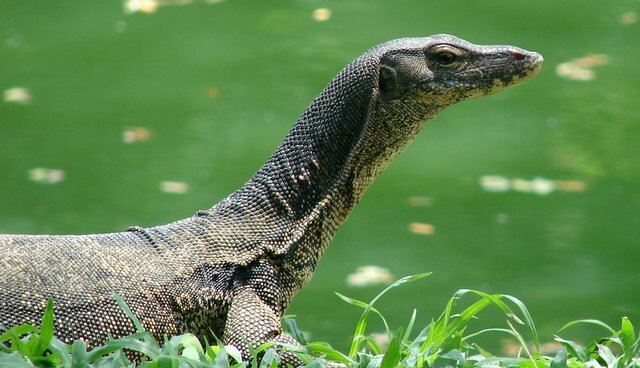 Besides being cousins to the spectacular Komodo dragons, monitors are reputed to be among the most intelligent of reptiles, some species being capable of counting to six (King, 1999). Monitors are also (so far) unique among reptiles because they have been recorded engaged in play and playful behaviors (more on this later). Recent research has also discovered that varanid bloodflow is surprisingly mammalian (Seymour, et al., 2013), and indeed they seem to have independently evolved a number of features that heretofore were thought unique to mammals. This and other parallels in physiology lead researchers to believe that certain intellectual traits are more ancient than previously imagined and/or have evolved independently between many lineages. (Manrod, et al, 2008). It comes as no surprise to the author that with more research into non-mammalian cognition, some surprising discoveries are being made about the evolution of intelligence and learning amongst what we consider to be primitive species. It would be untrue to consider monitors, dragons, and other varanids ancient and primitive (read: dumb) animals just because they are big lizards. Monitors, (and dragons among them) are considered a "young" species as far as geologic time is concerned. One famous account of monitors playing was witnessed at the National Zoo in Washington, D.C. "We studied the first Komodo dragon hatched in the Western world at the National Zoo in Washington, DC. This lizard ... would explore objects such as old shoes, small boxes, even soft drink cans and grab and shake them like a dog with a slipper. And like the dog, the lizard would not try to eat the object. She would also engage in a tug-of-war with her favored keeper and remove handkerchiefs or notebooks from a keeper's pocket and try to keep them." (Burghardt, 2010) Similar behaviors have been observed in turtles, fish and even invertebrates, like octopuses. It is also true that new species are discovered all the time. But each time a new vertebrate species is discovered, it is pretty big news in the zoology world. In the case of amphibians, we may even be losing vital species before we even knew they existed - so each new description is a big deal. Perhaps most importantly, this discovery will also go a long way in helping authorities protect these (now distinct) species from commerce and habitat destruction. Source: University of Kansas. "Undercover researchers expose new species of lizard for sale on Philippine black market." 15 January 2015. Burghardt, Gordon, "Comparative Reach Play and Brain" American Journal of Play, Winter 2010, p 346-347 Fry, B.G. Vidal, N; Norman J.A. ; Vonk F.J.; Scheib, H.; Ramjan S.F.R; Kuruppu S.; Fung, K.; Hedges, B.; Richardson M.K. ; Hodgson, W.C.; Ignjatovic, V.; Summerhays, R.; Kochva, E., "Early evolution of the venom system in lizards and snakes"(PDF). Nature, February 2006, 439 (7076): 584–588.